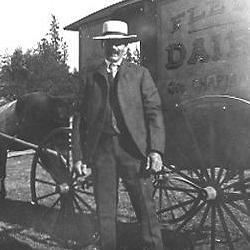 Dairyman George Chapman and Flett wagon. On Tuesday, September 17th at 7 pm the Lakewood Historical Society presented a program on John Flett, one of the earliest pioneers in the Lakewood area. It was held at St Mary’s Episcopal Church, 10630 Gravelly Lake Dr SW.
Beth Julian, descendant of John Flett, showed family photos and shared the story of the Flett Family’s contributions. There is still evidence today with the Flett house, built in 1899, on Bridgeport Way. A creek that ran through the original property and several other businesses retain the Flett name. John Flett and his family made a difficult journey from the Red River area (near modern Winnipeg) across the Canadian Rockies to Puget Sound in 1841. These “Red River” settlers arrived in this area several years ahead of Americans coming across the Oregon Trail. Although the Hudson’s Bay Company sponsored this migration, they provided little support to the settlers once they arrived. Many, including John Flett, moved south of the Columbia River where American homestead laws allowed settlers to claim up to 640 acres of rich farmland. 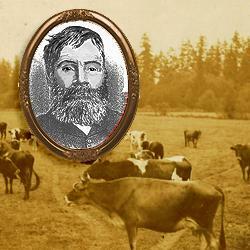 Eventually, John Flett returned to Puget Sound in 1859 and for a time taught on the Puyallup Indian Reservation. He homesteaded near Fort Nisqually and the community of Flett, which included a streetcar station, grew up in the area of his home. Flett was later absorbed into the town of Lakewood. The Flett name continued in the history of south Puget Sound as their descendants founded the Flett Dairy, a Pierce County business that was in operation until 1994. The Flett family is an example and an essential part of the history of Pierce County. Their story is one we can all share and take pride in.